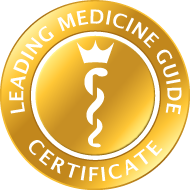 The Leading Medicine Guide's quality assurance is ensured by the following acceptance prerequisites. Active participation in medical conferences, symposia etc. Here you will find medical experts in clinics and medical practices in the medical field Cholangiocarcinoma. All listed physicians are specialists in their field and have been carefully selected for you according to strict guidelines. Please select a location or a clinical focus. The experts are looking forward to your contact.